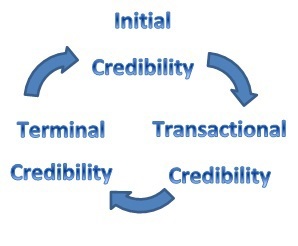 As an entrepreneur or the owner of a business organisation, your business credibility determines how successful you are, as it tells people – your current and future client base, business peers and potential alliances, your employees and even your competitors – what to expect of you and your business. This is your business reputation and without a good reputation, i.e. one that tells others they can trust you and that you’re someone they want to do business with, what exactly do you have? This reputation springs not only from your personal actions, the way you interact with others and the way you present yourself, as it also springs from, amongst other things, the way your office and website are presented as they too are indicators that help others to form an opinion about you and the business organisation you represent. Never make promises you can’t deliver as this is a sure-fire way to destroy your business credibility and undo all the hard work you’ve put in – bear in mind that business credibility can be difficult to build but it’s very easy to destroy. We’ve all found ourselves in situations in which there’s a sense of urgency to deliver, and often to deliver right now, but you’ll find that only by making promises you can deliver will your business credibility remain intact and strengthen over time. Social media has emerged as one of the most important tools business entrepreneurs and business organisations can employ, but to use it incorrectly opens the door onto a world of possibilities that could destroy your credibility for somewhere between the foreseeable future and forever. Social media has the potential to make or break your business credibility – make it, don’t break it. People love to be flattered but it’s a mistake to tell people what they want to hear if they’re going to be let down – nothing destroys credibility in business or any other area than hurt feelings. Instead of telling people what they want to hear, look for ways to soften the blow the truth is often capable of delivering – they mightn’t like to hear it but it’s less dangerous for you and often for them as well. Your website is often the first contact that potential clients will have with your business organisation and if you’re not delivering outstanding user experiences the credibility of your business organisation is going to take a dive. The more professional your website, the better the impression it will make and the more credible your business organisation come across as. Credibility is based on honesty, transparency, truth and trust, none of which you’re conveying when you try to be someone you’re not, plus it’s a difficult façade to maintain and when you’re exposed your credibility will quickly crumble. Everybody has weaknesses and flaws and whilst it won’t do you any favours to tell the world what they are, trying to cover them up by pretending to be something you’re not shows you’re not only disingenuous and untruthful, but that you also lack self-confidence which is just as bad for your credibility. As with your business website, the workspace you operate from says a lot about your business organisation and how credible it is, and like your website, your business’s office space is often the first contact potential clients will have with your business organisation. Businesses and entrepreneurs operating from home should consider options like virtual offices so as to put their best foot forward and make favourable impressions. Credibility is incredibly important in business because it tells others what to expect from you and your business organisation. Moreover, an excellent way to view credibility in business is that it’s difficult and often time consuming to build but easy to destroy, in fact; you can destroy your credibility in an instant.